FRP repair is a very effective method for retrofitting and strengthening structures. Fiber reinforced polymer (FRP), also known as fiber reinforced plastics, are two component composite materials used widely in buildings and industry. These materials owe their popularity to their wonderful unique properties such as low weight. The stiffness of the fiber is necessarily higher than the matrix stiffness. The matrix does not affect fibers, chemically. The adhesion between the fibers and matrix is good enough. The matrix protects fibers against environmental attacks and erosion. In fact, the main role of the matrix is to transform the shear from fiber to the adjacent material and the control of the local buckling fibers in compression. The matrix should also prevent mechanical damage of the fibers. The fibers are the major component of FRP system due to high strength and modulus of elasticity. The fibers in FRP materials could be layed in one direction or in two perpendicular directions. FRP resin is served principally as a binding medium that holds the fibers together. As it was mentioned, much of the FRP material load carrying capacity is provided by fibers. Therefore, it is fully anticipated for the FRP fibers to have higher rupture resistance and elastic modulus. It also has a strong resistance in a variety of environmental conditions, and FRP fibers must also be able to withstand elongation. Undoubtedly, the most prominent and most important property of FRP materials is their resistance to corrosion. In marine structures such as ports and coastal structures, the optimal resistance of FRP composite materials to corrosion is the most useful feature of FRP rebar. FRP fibers also benefit from very good insulation properties. In general, these materials are magnetic and electrical neutral and therefore could be considered as a very good choice for insulation. Therefore, the use of FRP rebars reinforced concrete in areas of the hospital that are sensitive to magnetic waves, as well as conductive paths of magnetic floating trains, airports bands and radar centers will be highly efficient. The use of FRP composites in strengthening, retrofitting and repairing reinforced concrete structures has grown considerably in recent years, with the main reason being the need to extend the life of the infrastructure and improve the infrastructure throughout the world. The main advantages of fiber-reinforced plastics are high corrosion resistance, easy to install at the installation site and their low weight. The other reason for robust use of FRP materials is the decline of the cost of these materials. In last two decades, the use of FRP composites was considered as a luxury and expensive way to be used in ordinary construction, while nowadays the advance of the technology of their manufacturing has push the price of these materials to fall far below. In the last years, the technical knowledge regarding the use of FRPs, including their mechanical behavior and applications, while now we can see at least one research article in every scientific journal in civil or mechanical engineering issuing a specific aspect of FRP composites. a significant number of scientific articles in journals and conferences related to the use of FRP products in retrofitting are devoted. This growing trend witnesses the approach and importance of this new technology, which sought to expand the need for and attention to strengthening and retrofitting of structures using composite materials and to improve the technical knowledge to design and use of these materials. Explaining the methods of analysis and taking into account the safety factors in design with economic considerations led to the formulation of guidelines and regulations for computational and executive implementation, such as Canadian ISIS, FIB Europe and ACI 440 R codes. Growing FRP products supply, production and distribution, leading to lower FRP prices and increased purchasing and sales of FRP. The improvement of the properties of FRP materials and resins in recent years has led to using these novel materials in most of retrofitting projects. Anti-corrosion properties of FRP materials along with high mechanical strength have led to combination of two important tasks: strengthening and anti-corrosion coating in concrete, steel, bridges, pipes, reservoirs and petrochemical and industrial facilities, simultaneously saving time and cost. The use of FRP in reinforcement of concrete structures is less expensive than the destruction of reinforced concrete structural components and traditional retrofitting. The modified FRP production method has led to the production of products with higher resistance properties and higher technical specifications with lower FRP prices. Optimizing FRP fiber composition with matrix (epoxy resin FRP) is possible now for better compatibility of FRP systems. There are two general types of FRP materials that are used to construct, refine and retrofit structures. These two types include FRP rebars and FRP covering materials such as FRP wrap and FRP laminate. In addition to these two types, FRP profiles of I and U shape, box and angle are also used these days to construct new structures and repair buildings. The following describes the use of any of the fore-mentioned materials in the FRP retrofitting system. FRP rebars, which are manufactured in three types of GFRP glass fiber, CFRP carbon fiber and AFRP aramid fibers, with epoxy, polyester and vinyl ester resin, nowadays are used in various industries and in building retrofitting. One method that uses FRP rebar for strengthening and reinforcing is a near-surface (NSM) method, which includes the NSM FRP Rods and NSM FRP Strips. The combination of steel and concrete is a high-strength compound, and this suitable fit between steel and concrete makes it one of the most utilizable and quality concrete elements of the concrete section. But there is a problem called oxidation for steel. Especially when due to reasons such as lack of proper concrete and cracks, inadequate concrete coatings, inappropriate weather conditions, etc., the steel element is exposed to moisture, salts, chlorides, etc., and starts to ring and It causes concrete to burst. This problem can be solved using FRP spindles. High strength tensile FRP spindles, acceptable elastic modulus, high corrosion resistance, good resistance to fatigue and creep, good adhesion to concrete, insulating against electromagnetic waves, light weight and light weight, which makes it easy to install and operate quickly. Is a very suitable element for replacing steel, which improves bearing capacity, increases structural strength, reduces corrosion and lightness of the structure. In the design calculations, we must also note that FRP materials have a low resistance to fire, so that their resistance should be neglected in designs, but can be improved by using anti-fire resins. If there is a longitudinal crack in the concrete cover, the bonding between rebars and concrete decreases intensively. Also, if FRPs are exposed to ultraviolet waves, severe alkaline environments, frequent drying and melting, and melting and freezing cycles, their behavior will be significantly degrade. Experiments have shown that FRP bars are not ductile and that they will behave linearly until the moment of failure. Therefore, FRP-armed concrete beams, show a linear behavior until failure and therefore their failure is brittle. FRP strips are mainly used to retrofit, improve and enhance existing structure behavior or to repair damages created in the current structure as a modern engineering method. As mentioned, the key feature that makes this material suitable for retrofitting is its non-corrosive properties and high resistance to weight ratio. Therefore, various techniques have been developed to reinforce concrete structures using FRP materials. FRP strips that adhere to the outer surface of a concrete member or any other surface are known as EBR-Externally Bonded Reinforcement. 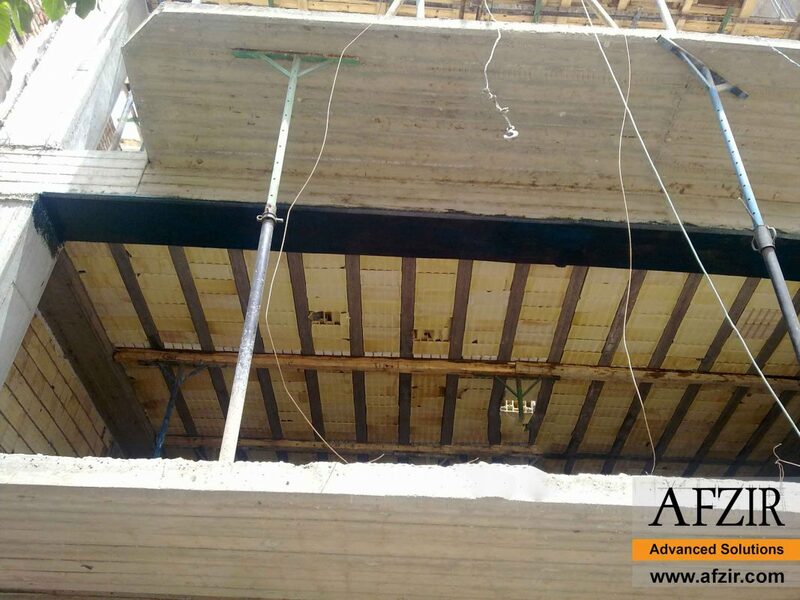 For example, strengthening of reinforced concrete beams against bending using the EBR method is done by sticking the FRP sheet to the tensile surface of the beam. 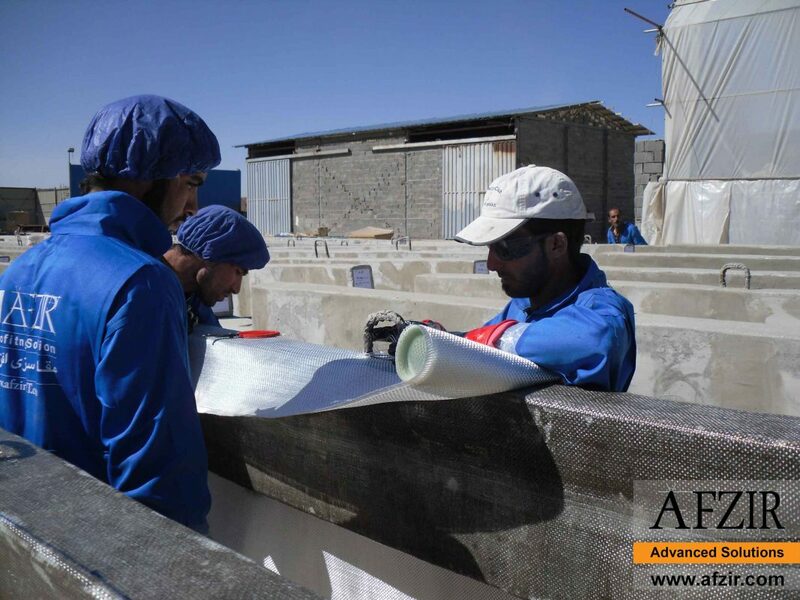 Before installing the sheet in this method, preparation of the installation surface is of special importance. Surface preparation includes elimination of contaminations and poor surface layers to improve the underlying properties and create a new surface with a suitable structure. 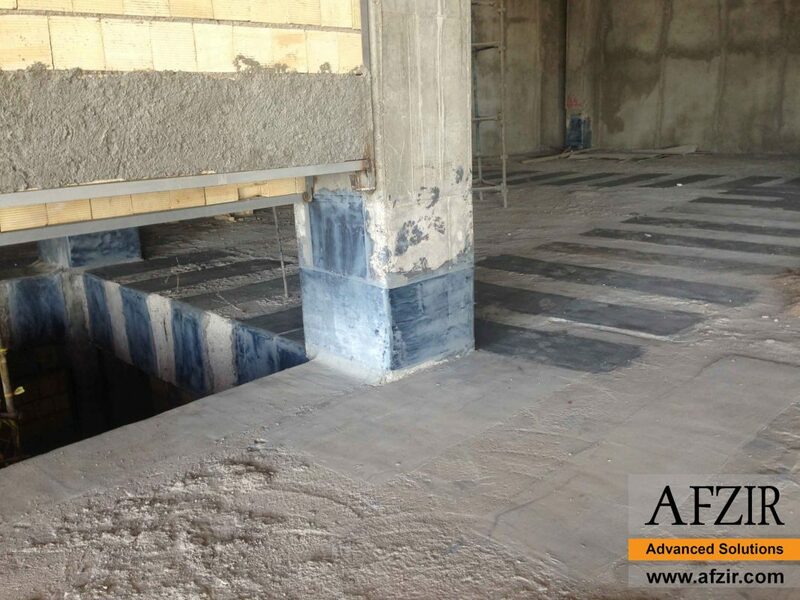 For this purpose, firstly, using methods such as surface rubbing, sand blasting or water pressure, the surface layer of the concrete is thinned to an instance so that aggregate surfaces appear and provide a stronger surface to create more adhesion between the FRP layer and the concrete. To be Then, using air pressure or water pressure, dust and dust particles are removed from the concrete surface. Then, using the appropriate material, the pores are filled and, in the end, using a suitable epoxy, the FRP sheet is bonded to the concrete surface. In this method, prefabricated FRP sheets (sheet prepared at the factory like CFRP laminate) or ready-made in-place method (plated FRP fibers with adhesive at the site) can be used. In order to reduce the probability of occurrence of detachment phenomenon, the quality of adhesion between sheets and concrete should be raised. Surface mounting can be carried out in a simple, conventional manner, either by applying the prestressing in the FRP sheet before connecting it to the surface of the beam, or by providing the necessary containment, such as the U-shaped strips at the bottom of the sheet, to reduce the possibility of detachment of the sheet from the surface of the beam Load, done. The FRP repair, strengthening and retrofitting projects are now widespread and structural damage and strength can be enhanced by using FRP materials. In the past two decades, the emphasis on building and repairing structures around the world has been concerned, following the erosion of infrastructure and the need to strengthen structures to meet strict design requirements. On the other hand, the seismic reconstruction of structures, especially in earthquake-prone areas, has become very important. In the meantime, techniques for the use of FRP composites as external reinforcers have been found to be of particular importance in terms of unique FRP mechanical properties, including high strength, lightness, chemical resistance and ease of use. On the other hand, these techniques have become particularly attractive due to rapid implementation and low costs. FRP composites were initially used as reinforcing materials for concrete bridges as well as confinement in reinforced concrete columns; however, due to initial research efforts, since the mid-1980s, there has been a great deal of development in the use of FRP materials in structural retrofitting. Various applications have been made to wooden, masonry or even metal structures. Various component parts including beams, slabs, columns, shear walls, joints, chimneys, arches, domes and trusses have been strengthened with FRP materials. In comparison with the use of steel ties and steel spirals, the confinement technique using FRP has the capability of providing continuous confinement for the entire column cross section. Also, due to very good inherent FRP properties (high ratio of resistance to weight and high resistance to corrosion and electromagnetic neutrality), they can be successfully used in strengthening and rebuilding concrete members. FRP rebar can be used in concrete beams and concrete slabs as an alternative to all or part of the tensile re bars required. It can also be used in concrete joints and increase its ductility. FRP is also used to reinforce shear walls. FRP can increase the ductility of the walls and restrain them.